Today was quite a special day with the inaugural Horton Park, parkrun. I have many memories of Horton Park living near it in my youth from around the age of 14 to 24. Like anybody else I have good and bad memories, but most of my memories from Horton Park are good. It was interesting going back to the park. It’s in a lot better condition than I remember it, although some of the buildings like the bandstand have now gone. But all in all the park was just as I remember it, fond memories. And it makes a great place for a parkrun. The course is challenging with half of it being uphill and the other half downhill. The start is uphill too before turning to the right and downhill back towards the finish before going uphill right to the top. You have to make sure you have enough energy left to get up the uphill, you do 3 ½ laps of the course although on the last downhill you can afford to give it a little bit more. I managed 30:43 which for the type of course is very good for me. This included my sprint finish which I am going to have to do every time I run this course now! I was wearing some new shoes too, Brooks Ghost 7. I have been having deep muscle massage on my legs and the guy who’s doing it, Peter May, told me I was wearing the wrong type of shoes. Many years ago I went to a shop called Sportshoes Unlimited and had gait analysis done. I was told I needed to wear support shoes for running and have done so everysince. However Peter took one look at my legs and told me that I should be wearing neutral, cushioned shoes not support ones. And the problem I thought was my Achilles wasn’t that, but a very tight right calf possibly caused by wearing the wrong shoes! Peter has sorted my calf out and I am running freer and better than ever. But I had already bought some new support shoes from a shop called Up and Running in Huddersfield. I took them back yesterday and they did a gait analysis on me and I am indeed a neutral runner. So I came away with a pair of Brooks Ghost 7’s and they performed superbly today. I felt so comfortable and at ease running in them, that I didn’t even notice I was wearing them. I’m quite sure the work Peter has done on my legs and my new Brooks have helped me to such a good time. But what I was most happy about today was the fact that I could run after Thursdays club run. This was tough for me and took a lot out of me, but my recovery time is improving all the time and today was proof of that. And after the parkrun I still feel as good as before. This is boosting my confidence no end and my legs are feeling stronger than ever. This will be tested tomorrow when I go out on a training run over moorland. I’ve got a route in mind that will really test my abilities and allow me to see where I am in relation to the races I’ve entered. 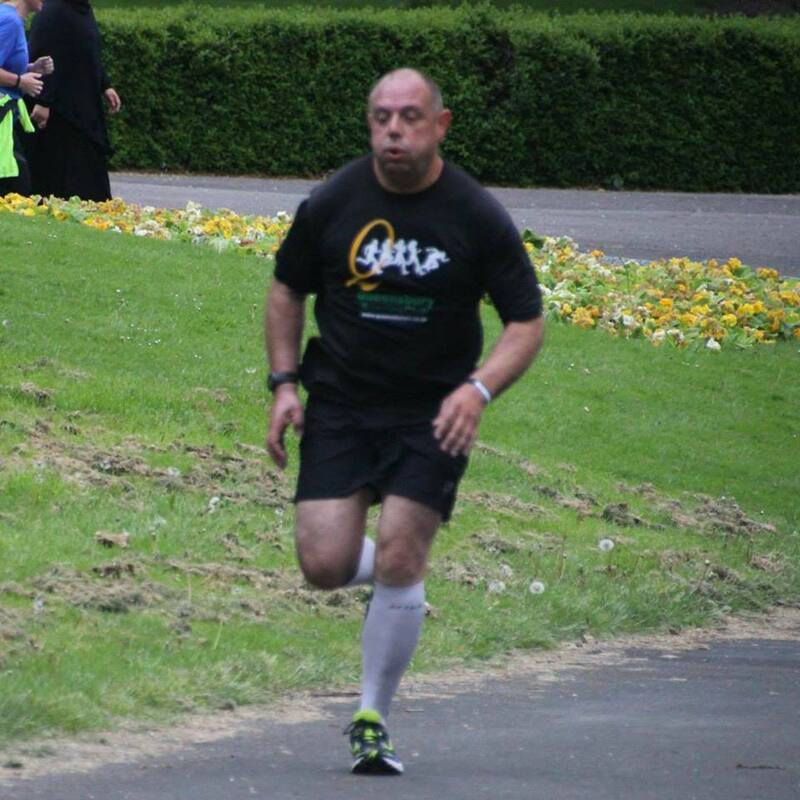 This is me in action at the trial for Horton Park, parkrun.